Texas A&M International University (TAMIU) academic and administrative policies reflect a commitment to maintain the quality of distance education courses and programs. In 2011, the Distance Education and Instructional Technology Committee (DEITC) at TAMIU was created to review and recommend procedures for online course development, quality standards, and evaluation mechanisms. 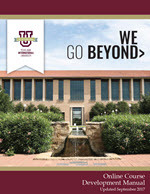 TAMIU became a Quality Matters program subscriber at the beginning of the 2011-2012 school year. 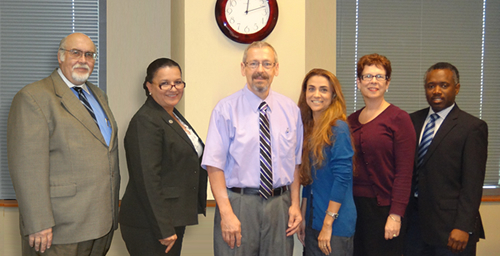 Photo taken from luncheon of inaugural TAMIU peer reviewers. From left to right: Dr. Pablo Arenaz, Dr. Patricia Abrego, Dr. James Norris, Dr. Claudia San Miguel, Dr. Whitney Bischoff, Dr. Leebrian Gaskins.